After the overwhelming horrors of the first half of the twentieth century, described by Ian Kershaw in his previous book as being 'to Hell and back, ' the years from 1950 to 2017 brought peace and relative prosperity to most of Europe. Enormous economic improvements transformed the continent. The catastrophic era of the world wars receded into an ever more distant past, though its long shadow continued to shape mentalities. Yet Europe was now a divided continent, living under the nuclear threat in a period intermittently fraught with anxiety. There were, by most definitions, striking successes: the Soviet bloc melted away, dictatorships vanished, and Germany was successfully reunited. But accelerating globalization brought new fragilities. The interlocking crises after 2008 were the clearest warnings to Europeans that there was no guarantee of peace and stability, and, even today, the continent threatens further fracturing. 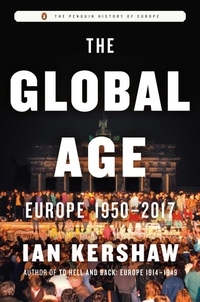 In this remarkable book, Ian Kershaw has created a grand panorama of the world we live in and where it came from. Drawing on examples from all across Europe, The Global Age is an endlessly fascinating portrait of the recent past and present, and a cautious look into our future.